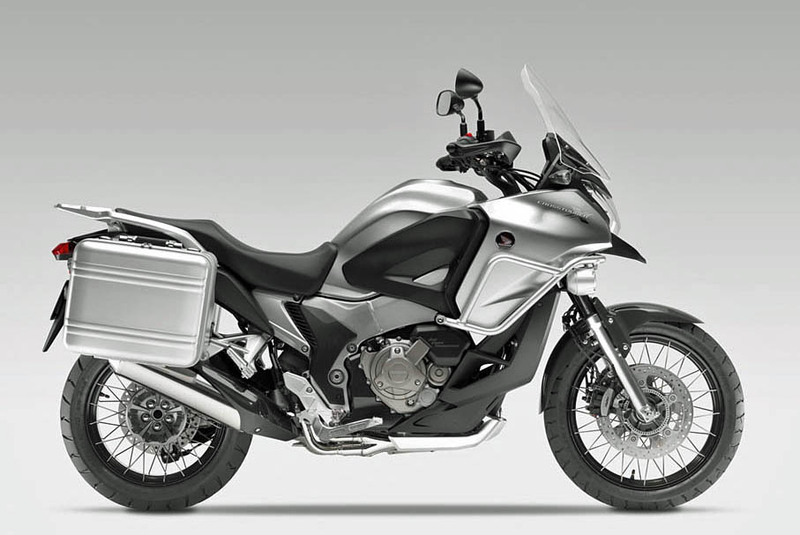 These are pictures of Honda’s Crossrunner, a street bike with adventure styling and ergonomics powered by a version of the Honda Interceptor 782cc v-4 engine with VTEC. The Crossrunner appears to be a do-it-all machine that can play in the twisties, tour or commute. The comfortable, upright ergonomics and 5.7 gallon gas tank help with the touring, while the 17 inch wheels and sporting rubber contribute to an allegedly frisky nature. No lightweight, the Crossrunner is reportedly in the neighborhood of 540 pounds. The Crossrunner is expected to go into production shortly. Honda also displayed another V-4 model. This one features a version of the VFR1200F engine and automatic transmission together with shaft drive and a single-sided swingarm. 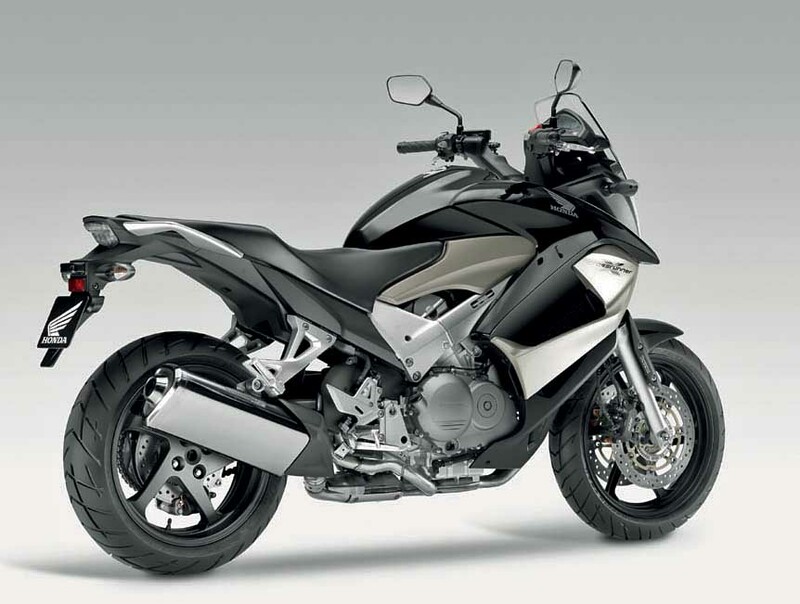 This bike (pictured below) is called a “Concept” by Honda, but it also looks near production form. We have no idea whether either of these models will make it here to the United States any time soon. i find the new releases from honda, in general, to be a great letdown. for years i’ve been waiting for them to deliver. the superhawk (vtr 1000) is easily twice the bike that the vfr 800 is. great website ,though. I looked at a used VFR Interceptor but I couldn’t get comfortable on it. It definitely needed taller bars and a larger windscreen. I ended up with a BMW F800ST. There is a large selection of windscreens to mount for this bike which Honda doesn’t have. I probably won’t buy another Honda after owning my BMW. If you ever owned a Trans Alp you will understand this bike!!! I like it. It looks comfortable, has a decent sized gas tank, and should be able to perform a variety of functions very well. Commuter, tourer, weekend corner carver. I like a versatile bike. 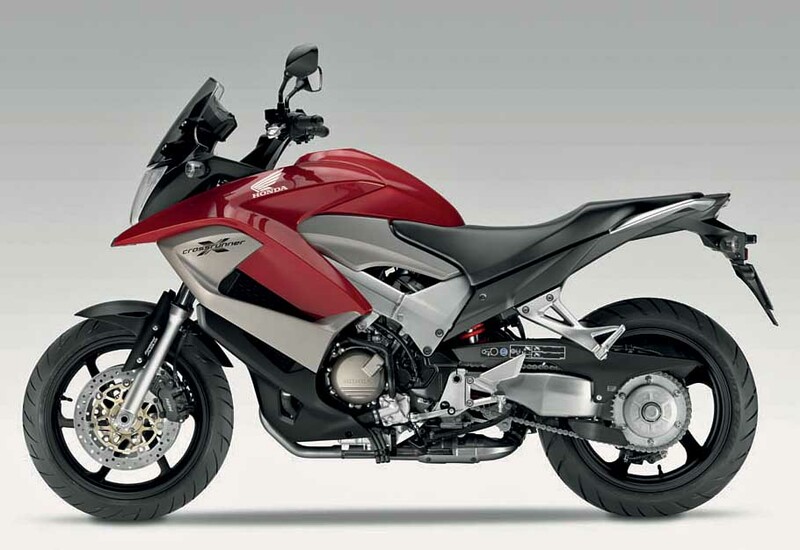 Also Honda has bags for the VFR800, I hope they will be offered for this bike. Bringing some of the technology forward from the VFR should help to keep the price at least in the “reasonable” category. Nearly everyone agrees that V-TEC is not an asset on this motorcycle (or any other for that matter). So why does HONDA keep offering V-TEC to us? Don’t they ever listen to actual riders of their motorcycles? I think that HONDA has so much pride that they are even willing to take a loss in sales to prevent saying that they produced a blunder when they decided to put V-TEC on a motorcycle. “A VFR800 with a higher center of gravity. Come on Honda! How about a 420 pound 800cc V4 supersport? What do you mean a higher center of gravity? The only thing higher is the riders upper torso which is a good thing. No more numb throttle hand after an hour but all the other greatness the VFR has to offer. So it the Crossrunner coming to the US or not? I keep getting conflicting information. And I hate to beat Honda down farther, but who here thinks the ‘Crossdresser’ will be priced above the 2011 Yamaha Super Tenere. If the Honda comes stateside, then cool, but I have the distinct feeling after pricing is announced, it will be a palm-to-the-foreheard moment for folks that Honda could pull itself out of the souless-rut it has been in for the last decade. Hey I tried to ride the VFR1200DCT the other day and the Honda Dealer said I have to buy it first and he wasn’t kidding. I did ride up on my BMW K1200. He said Honda isn’t like those guys which I figure he meant BMW who will let you test ride their bikes. Is this a dealer thing or a Honda thing? Usually Japanese OEMs and it’s dealer are like that. BMW, Triumph, H-D and former Buell do(did) offer demos. Maybe things have change with some of them too. More of a dealer thing, IMO.We have two multi-brand mega dealers nearby. Lots of overlap. One will service anything and let you test ride. The other one won’t even let you test ride any of there USED bikes. Unless the distributor/importer has a special program to provide demo bikes and related assistance to the dealership, it is left up to the dealership. The dealership usually relies on financing to buy the bikes in their inventory, whether through a local bank or a national bank or some special source of capital or financing provided by the distributor/importer. But no matter the means the dealership uses to buy the bikes, they own the bikes, and are ordinarily required by the financing source to insure the inventory against damage of every sort. The dealer will usually try to get by with the cheapest possible insurance, which means high deductible, and this gives them motivation to minimize the amount of demo rides that do not lead to a purchase. In most cases of purchase the buyer has a grace period for returning the bike, albeit with restrictions on mileage and time. Some states have laws requiring this for cars and sometimes for motorcycles and sometimes for anything. As such, one way to get a demo ride on a bike that you are serious about buying is to first check with your state laws and make certain that you understand the applicable grace period and then go in and buy the bike. Some dealers that discourage demo rides will change their tune immediately if you ask about the down payment and then write a check, although do not do this unless you are serious about buying the bike or unless you trust the dealer and you both have a clear understanding that the check is not actually to buy the bike but is just to demonstrate that you are serious. Be very careful here about the understanding and anything that is not in writing, because once you write a check, there is always the possibility that no matter what you thought the understanding was, the dealer will decide that you were never serious and were just taking advantage, and will keep the check, leaving it for you to try and recover in small claims court. You can of course call the bank and stop payment on the check, but courts consider this the same as writing a bad check and you could be visited by the sheriff and find it necessary to defend your actions in court. That all said, there is the possibility that some distributors such as BMW have some sort of cooperative arrangement with the dealership to assist them with the cost of offering demo rides. But it does not seem that BMW simply provides the dealerships with demo bikes, because the policy differs from one BMW dealership to the next. A VFR800 with a higher center of gravity. ROXX, you called it. Give us a light, fast, and fun 800cc V4 ripper! Or a 320 pound 400cc V4 ripper. We didn’t ask for another boring VFR800 with factory installed Convertibars. After looking at the Ducati Diavel, this thing looks amazing. I like it, looks very contemporary. Crossrunner is edging the Suzuki Madura in the “Ugliest Bike” contest. It’s been christened “SeaDoo” on another website. My god man! haven’t you see a BMW….. designed by a plumber on crack…. and you think the Honda’s ugly?? Again, Honda is looking to boost profit by capitalizing on the goodwill it has earned over the decades and re-skinning old technology with cost-saving, unpainted plastic (acceptable for my $6K FZ6 but on on a $12K VFR. Its a short-term move to pad executive bonus but will drain brand equity over time. Follow the leader? What is the first thing a VFR owner does? Puts taller bars on their bike. Why in the world does the motorcycling industry believe that the only way you can build something with an upright, comfortable riding position is to make it look like and call it an “adventure bike”? The more I study the crossrunner, and ponder it, the more it annoys me. Particularly with regards to the styling. The quoted weight seems to be almost exactly the same as for the present Interceptor/VFR800. The styling is different, and the muffler, and of course it has different handlebars and a different wind screen. The pictures suggest to me that the windscreen on the VFR800 is more substantial, and if you want taller handlebars, there are several after-market options, including Cyclops, which seem to be very well made. The styling of the VFR800 is also much cleaner, in my opinion at least, and doesn’t have that silly proboscis sticking out in the front. The only advantage I see over the VFR800 is that it comes from the factory with the taller handlebar already installed, saving you all the hassle of messing with that. But then you don’t get the VFR800’s more substantial windscreen. I think I would be more inclined to get the VFR800 and do the custom work to install after-market handlebars. In fact, as I think about it, it is exceedingly likely that you could buy a set of the handlebars and related cables and what not that are made for the Crossrunner and install them on the VFR800, finishing the whole job in a half day or less. Are the footpegs in the same position as the VFR, or lower? Is the engine tuning different? Those are questions you should ask. The seat looks much more comfortable on the Crossrunner because it’s flatter, and especially for a passenger, and they won’t be sitting as high above in the wind as on the VFR. Another thing about the VFR is the silly high-mount mufflers. I would prefer the muffler on the Crossrunner which is better-looking too IMO. It seems that a taller and wider windscreen on the Crossrunner could easily be fitted. I agree that the muffler placement on the Crossrunner is better than on the VFR800, both functionally and aesthetically. The footpeg placement is an important consideration. It might be possible to fit a taller screen to the Crossrunner without undue difficulty, but this assumes that the supporting brackets are adequately sturdy, and they might not be. The load that has to be supported can change to next to nothing for a small screen to something several times greater for a larger screen. I would cease studying it, then. Who needs the aggravation? Why does an adventure “800” weigh more than a Ninja 1000 ? Triumphs new Adventure is 462 pounds. Honda needs to learn the word “Diet” again. Remember the 900RR? wait, i see the method to their madness. i know recycling is all the rage here in the 21st century, but good grief charlie brown…!? it’s the old VFR… reimagined…!!! LOL obvious weight issues aside, the cross-whatever looks damn good. in the hedonistic world that is motorcycling, nailing the styling is 90% of the game. we’re shallow, if it looks good, we’ll buy it. all the big money pieces are the same… ie. wheels, engine, frame, swingarm, probably the wiring harness, ecu, rotors, calipers, etc. this will cost a fraction to produce, have low warranty claims (since it’s been debugged), and result in good margins. and when margins are where they should be (not eroded)… people eat, the lights stay on, and companies and niche industry like motorcycling survive. from a “green” business and engineering perspective this is quite brilliant…! i fully expect to see more manufacturers embracing this. unlike automobiles, motorcycles don’t benefit from the volume sales needed to justify the high cost of constant retooling. i know it’s sobering to hear, but trust me when i say, we’re really not as special (to the mfg’s) as we think we are. All valid Points. W/E works for them. Where is the shaft drive on the first bike? It’s not my kind of styling (I like the new R1200R). It’s already heavy-ish. Might as well get that no maintenance feeling since it’s a Honda. Other than the final drive, I like that it’s more of a standard and a V-4. Why not bring back the Magna? Well, that one hooks to the wrong side of the foul pole.Nice try to extend the life of the VFR800 architecture, Honda. Now fire that particular MBA, may? Here is my question’…… where is the ST 1300 replacement the vfr 1200T ??????? +1. Wasn’t it due at EICMA this year? I think they caged it to bring the CrossTourer first because of all the flood of dual sport tourers and not be left out. Wow, that was a lucky guess. I made the wild prediction of an automatic transmission in the previous “sketch” post, and it came true! I am a vfr800 owner. I think vtec is great, makes the motor alot of fun. I also have a crf450x converted to a street legal supermoto/dualsport. I think a cross between the two would be alot of fun. We saw something similar with the Kawasaki Versys… being sourced from the 650r and it was a hit. Think of this a little larger with a little more power. The Honda Crossdresser- an other GS want-to-be. Not my cup of tea but best of luck to Honda on entering the field with the rest of the bunch. Looks like a couple of bikes developed by a “market survey” of too many motorcycle demographics. Adventure-Sport-Tech-Tour-Naked-DualPurp-ItAll is not a category. Honda…Go back to your roots and you will begin to grow. Trend setters-Hurricane, RC45, Sabre, RC51, Gold-Wing, Elsinore, CB, XR, VFR, CBX, Blackbird…. Boring does not sell. Stop listening to your Car Division and bring something exciting to market! Please! +1 I put almost 100k miles on my ’84 Sabre 700, loved it, especially flying by BMW K75s like they dropped anchor, embarrassing for them. Aside from the Goldwing, VF(R) and the CB, Honda started none of those classes! Think GPZ600, GSX-R750, Ducati 888, ZX-11 etc for some of those classes. improve – that’s the Japanese manufacturing way (and they’ve done it very well). And the current VFR is a sad testimony to the fact that Honda has even lost touch with the class that they created! ZZZZZZZZZZZZZZZZZZ…….. Overweight, underpowered and overpriced. (looks similar to the new Ducati cruser) Why not bring us the Transalp or the Varidaro? My choices are narrowed to two. Ninja 1000 and Tiger 800. Couldn’t agree more. Ninja 1000 please. lol…this bike that none of us has ridden yet is rapidly becoming the ‘standard’ by which other bikes (for people who can only afford one bike) will be judged. It’d be nice if they took off the bodywork. Honda’s still lost the plot. And V-Tec to boot, ugh. They both look pretty cool, if a bit on the porky side. Still, I’ll bet they prove to be fun rides. Honda sure managed to do something very confusing here. “Crossrunner” – A production bike, with some supposed “adventure” or whatever credentials, but that turns out to be basically a VFR800 with more comfortable ergonomics. This new VFR looks to me a significant improvement over the old VFR, however like most people I would just as soon that they had dispensed with the VTEC, because when Honda does variable valve timing, it accomplishes an improvement in fuel economy, but does not seem to have any benefit for broadening the engine’s power band the way that it does for most any other company that does variable valve timing. Still, this seems to me a good motorcycle. “Crosstourer” – A concept bike that is obviously a derivation of the VFR1200. In the UK they seem to be referring to this as “Crossfire”, and one Canadian on-line magazine has already mislabeled this bike the “Crosstour”, evidently unable to see the difference between this bike and that all-wheel-drive weird-looking five-door version of the Accord. The Crosstourer looks quite interesting. The wheels have spokes, but they also look skinny, like the wheels on the R1200GS. So it looks like it would compete with the R1200GS since it has that sort of wheel and the tubular protective thingy around the engine. But this engine will of course run circles around the engine in the G1200GS, and will probably even run circles around the new Ducati Multistrada. So, in a sense, in combines the best attributes of those two bikes. However, assuming that it goes to production (and is offered in the USA) my guess is that it will be quite a bit heavier than either of those two bikes. Given the amount of power they get from this engine in the VFR1200, I think it would make more sense to scale it down to about 3/4 size, i.e., 900cc, which would make it lighter for this variant, and wheel torque will still probably be limited by the traction available with those skinny tires rather than engine torque. There is also a second concept, which appears to a be a hybrid between a sport bike and a scooter. This looks better than the DN-01 or whatever they call that thing that is part scooter and part cruiser, but it still looks like an answer to a question that no one had asked. But, it is probably a better machine than most any scooter, and probably has a much better chance at commercial success than the DN-01. But we don’t yet know what sort of engine will be in it. And they had to go and LEAVE INTACT that Stinking V-TEC Gizmo, Hell of a NightMare, OverPriced Valve Adjustments and OverPriced V-TEC Buckets still inside the 800. Hurray for Honda and their Gizmos for the sake of Gizmos. I like the CrossRunner’s Cycle part tho. Looks kinda comfy and useful for daily grinding to touring. I have love for Shamu’s long legged cousin too. I xpect Honda to offer it with a standard transmission too for a lower MSRP and “i’ll do my own shifting, thanks” type of riders. Im just happy they are moving forward and going somewhere, where?…don’t have a friggin clue but at least going. Amen, V-Tec sooooo unnecessary and expensive. Sure looks suspiciously like the VFR with new clothes. Honda, your aiming in the right direction, but “close” only counts in horseshoes and hand grenades. Why is everything you make so damn sensible…!? Have you considered making anything “exciting”? Please tell me it doesn’t have that annoying half-way VTEC valve train ? Why doesn’t Honda do SOMETHING with the wonderful SP1/2 V-twin engine?? RC51 Engine, Sweet powerplant there…shame, danm shame. I would take it over the 800 V-4 any day. Gear driven cams…music. Bring back the Honda Executives who will make exciting decisions like using the RC51. Honda used to be exciting cutting edge. I used to love Honda. Now they only make good enough stuff. Who would have ever thought BMW would be the edgy motorcycle company out there. Honda what has happen to you? Hey agent i hear that upside down forks are just what they look like–upside down forks and have no benefit to the ride or other. Nobody I know wants an automatic dual sport, hopefully they have a standard transmission option for the Concept bike should it make it past that stage. the old school conventional forks aren’t exactly saying “cutting-edge” to me… nor is the previous-gen V4 powerplant. i can already tell the new Yamaha Super Tenere would be a better choice for my tastes, looks more purposeful too. USD forks aren’t “cutting-edge” either, and certainly not required in every motorcycle application. True, but they are on every new bike from dual purpose to MX to supersports. In fact, I can’t think of a new bike (2010/11) that cost’s over $10K (US) that doesnt have USD forks. cost is only one of the variables used to calculate value, my friend. you’re right Justin, USD forks aren’t necessarily for every application (i.e. budget, lightweight city bikes etc. ), but for the capable class Honda is going to be competing against, this just feels half-baked and dare i say, lazy. from the waist down, this looks like the exact same bike as the previous VFR 800; wheels, brakes, forks, swingarm, power plant (?!?!). between their cars and bike of late, Honda is on a cheeseball trajectory. CBR250 styled like a VFR1200 anyone? side radiators or one big one? 1200 seems to have a BIG one, lmao. 800 side mounted. Looks like a couple exciting new models from Honda to me. I especially like the concept vehicle using the VFR DCT eng/trans. Unfortunately I won’t be tall enough to ride either of these bikes. Dang stubby legs! Guys complain and complain about how boring and stoic Honda has been the last few years and then Honda comes out with 3 exciting/innovative new models in a row and people still aren’t pleased. Amazing. Squiky wheel sometimes gets oiled…all i have to say. Seems to be working, these 2 are the proof. I think I can see a chain through the rear wheel of the second bike. Which means it is not shaft driven, as indicated. I like the first two. But I’d never buy a bike without cast wheels. Spokes are over for me, for a lot of reasons. I don’t see a chain on the second bike, unless you are referring the second picture of the first bike. It’s shaft driven, check the other side pictures on other websites. Same Arm as VFR1200F. Lol. Spokes… here it don’t matter to me cause the wheel’s design are TUBELESS anyways. Plug the darn thing, air up and keep going.YES. Now that adventure bike with a VFR motor is a Honda I just might be interested in! I’d have to try the auto in the first place before deciding upon it. Wouldn’t know unless I rode it. I think it’s an old Interceptor engine.. I was hoping it was smaller version of VFR1200 with SOHC engine but I don’t think this is it. Kinda lame if you ask me, just look for an old Transalp. Very cool ”do it all” type of bike. Only thing I don’t like is that yet another bike is rippin off the beak from the GS series. How about some originality? Somebody check the specs on the Crossrunner–is it the motor from the old VFR? Or a sleeved-down 1200F motor? Looking at the engine cases, that’s a VFR800 engine. The very first sentance of the article says; “powered by a version of the Honda Interceptor 782cc v-4 engine with VTEC” – Duuuhhh..